Managerial Mid-Back Chair Is Fully Upholstered With Black, Bonded Leather. Black Frame Features Stylish, Open Loop Arms And A Five-Star Nylon Base With Dual-Wheel Hard Casters For Easy Mobility. Functions Include Pneumatic Seat-Height Adjustment, 360-Degree Swivel, Tilt, Tilt Tension And Tilt Lock. Capacity Is 275 Lb. Seat Measures 20-1/2" Wide X 20" Deep. Back Features A 3" Thick Cushion For Your Comfort And Offers A Size Of 20" Wide X 25-1/2" High.. 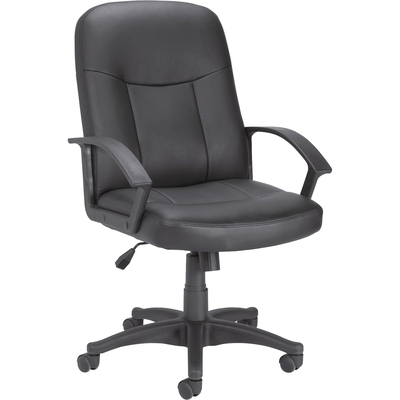 Managerial Mid-Back Chair Is Fully Upholstered With Black, Bonded Leather. Black Frame Features Stylish, Open Loop Arms And A Five-Star Nylon Base With Dual-Wheel Hard Casters For Easy Mobility. Functions Include Pneumatic Seat-Height Adjustment, 360-Degree Swivel, Tilt, Tilt Tension And Tilt Lock. Capacity Is 275 Lb. Seat Measures 20-1/2" Wide X 20" Deep. Back Features A 3" Thick Cushion For Your Comfort And Offers A Size Of 20" Wide X 25-1/2" High.